One is complete, the other three will finish by the end of next month. Ten hours and you’ll never view text the same. ABSORBING NARRATIVE STRUCTURE AT THE GUT LEVEL. The four prototypes that started in late January. It’s very simple. At the core of it everything is the ABT — the simple structuring device that tracks back to Aristotle. It’s the narrative ideal. Everything else is either a tiny bit more boring or a tiny bit more confusing. 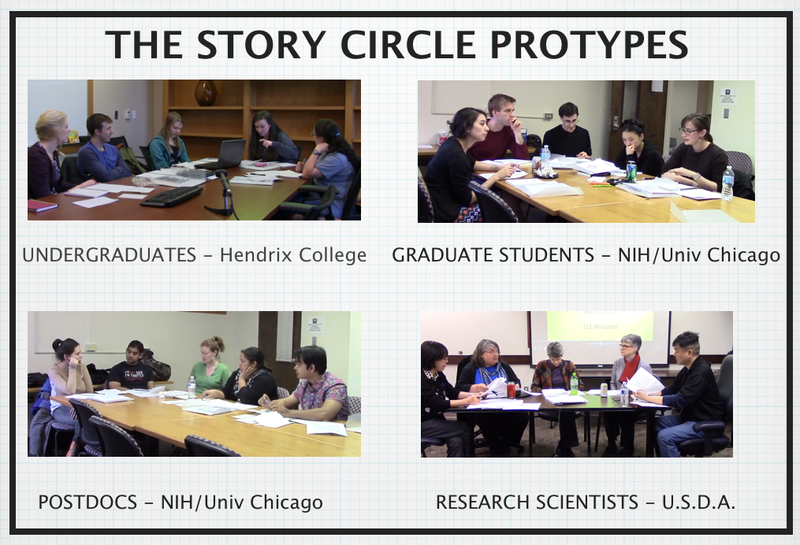 It’s five people doing 10 one hour sessions where they first, analyze the narrative structure of abstracts, then work on their own stories using the narrative tools developed in our Connection Storymaker Workshop. The specifics are laid out in my new book, “Houston, We Have A Narrative: Why Science Needs Story,” coming in September. All of the sessions have been recorded. We are about to begin analyzing the videos, producing a novel data set on how people improve their communication skills. Story Circles is the solution to the problem I laid out in the third chapter of my first book. The chapter was titled, “Don’t Be Such A Poor Storyteller.” It puts you on the path to solving that problem. Big thanks to George Harper (Hendrix College), Mike Strauss (USDA), Alan Thomas (NIH/Univ of Chicago) and all the wonderful participants.